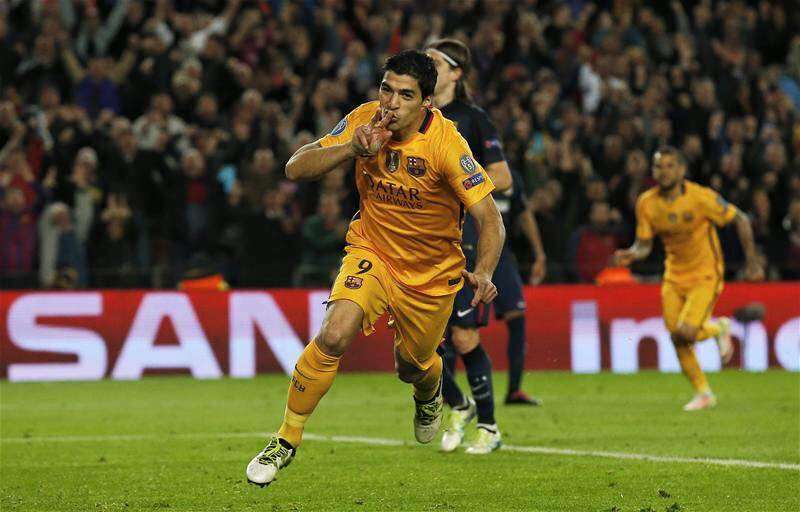 Barcelona triumphed yet again against Atletico Madrid in what was another nerve-racking contest between the two. The 2-1 victory also meant that Barcelona manager Luis Enrique remained unbeaten against Diego Simeone, taking his tally to seven wins out of the seven occasions the two have met. Atletico were off to a dazzling start with Simeone’s men coming out to put Barcelona under pressure higher up the pitch and upsetting their passing rhythm. It certainly worked wonders for the Rojiblancos as Fernando Torres opened the scoring after 25 minutes. However, the momentum was short-lived as the Spaniard was sent off after a second yellow for a reckless challenge on Sergio Busquets later in the first half. Barcelona took total control of the game ever since and the tables turned in the second half owing to Suarez’s double whammy. It was a routine day at the office for Ter Stegen as he wasn’t tested enough by Atletico except for Antoine Griezmann’s attempt towards the far post. Although he could have done better to avoid the away goal, one cannot totally blame him as it was a neat first touch finish. The Brazilian played an important role in both of the goals for Barcelona and remained a constant threat going forward on the right. He was also diligent defensively keeping Yannick Carrasco at bay throughout the game and arguably was the best player for Barcelona. The Spaniard was drawn out of position by Koke which created space for Torres to run into and open the scoring. However ever since Atletico went a man down, he had little to do defensively and did justice to his role. Akin to his centre-back partner, he could have done a little better to avoid the away goal but it is acceptable since he didn’t have enough time to react. Alba did not have much to contribute defensively after Atletico were reduced to 10 men. He also did a decent job of containing Griezmann and he was also diligent in attack combining with Neymar & Iniesta on the left. It was an above average game for the backbone of the Blaugranas as he kept the ball ticking throughout and was substituted in the later stages. The Croat too did not face a different challenge in the centre of the park and his physical presence came handy against the likes of Gabi & Koke. However, his contribution to the attack was minimal. Iniesta found it difficult to get his eye in during the initial stages but settled in the later stages of the game and was significant in build-up play. His combination with Neymar on the left was noteworthy and was substituted off later on in the second half. He often dropped deep into midfield to receive more of the ball and dictate play from the centre. The Argentine had a quiet first half while he really came into the act in the second half and played an important role for the equaliser. One might have wondered if Suarez was even playing initially as he was invisible for a major part of the game. Although he got a little lucky with his first goal, the second goal was a cracking header which not all strikers might have put away. For most parts of the game, he seemed the brightest of the MSN trident. He always kept the Atletico backline troubled with his trickery and even rattled the post with an exquisite curler. The young attacking midfielder came on for Ivan Rakitic but wasn't very involved in both goals. Roberto came on for Sergio Busquets and helped Barcelona kill the game off, helping the forwards ahead by keeping the ball well. The Turkish midfielder came on for Andres Iniesta to face off against his old team but did not have much time to make any visible impact.